Sircuit Savant™ vita A alternative serum is designed to help energize and tighten skin while providing rich hydration and radiance. This comprehensive anti-aging treatment serum handles all the vital jobs of hydrating, energizing and smoothing, while also being beneficial for those with problem skin. Formulated with a brand new botanical alternative to retinol called Vita-a-Like™, this powerful blend of SUPERCHARGED ingredients provides all the anti-aging benefits of retinol, but is retinol-free. This multi-tasking serum is also fortified with protective antioxidants and skin-calming benefits that help provide additional mitochondria support. The results from this daily treatment serum are just straight up sensational. Naturally derived and helps to minimize the risk of irritation often associated with retinol. Smoothes and helps to improve the texture of dull, uneven skin. 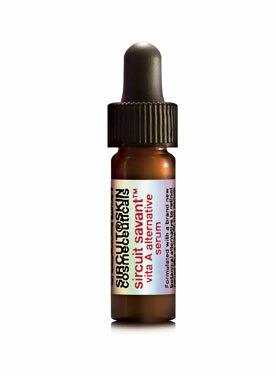 Helps reduce appearance of fine lines, wrinkles, blemishes and hyper-pigmentation. Matrixyl® Synthe’ 6™: A powerful peptide that boosts 6 skin building essentials that helps to reduce the appearance of fine lines and wrinkles particularly on the forehead and crow’s feet. Vita-a-Like™: A botanical alternative to Retinol with high tolerance and stability that reduces the common risk of irritation associated with Retinol. It also accelerates epidermal cellular turnover and has anti-wrinkle activity. Tocopherol (D-Alpha): A Chirally correct form of Vitamin E and the most effective. Extracted from natural bean and seed oils, this powerful anti-aging antioxidant helps to protect against the damage done from free radicals. Loveage Oil (Levisticum Officinale): Native to Persia and a powerful anti-aging ingredient. It helps to increase the potential of epidermal growth factors to support the increase of keratinocytes. Glutathione (L): A powerful Chirally Correct antioxidant from spinach and purslane that helps to protect the skin from free radicals and oxidative stress. UGL Complex: A soothing, AHA free exfoliator that helps to diminish the appearance of wrinkles while increasing hydration and firmness. Bisabolol (L-Alpha): From Chamomile, to calm and soothe dehydrated and damaged skin.